US President Donald Trump (2L) and Russia's President Vladimir Putin wait ahead a meeting in Helsinki, on July 16, 2018. The US and Russian leaders opened an historic summit in Helsinki, with Donald Trump promising an "extraordinary relationship" and Vladimir Putin saying it was high time to thrash out disputes around the world. President Donald Trump vowed Thursday that if his dealings with Russian leader Vladimir Putin don't "work out, I'll be the worst enemy he's ever had." Trump made the statement during an interview at the White House with CNBC's Joe Kernen that will air in full Friday at 6 a.m. ET on "Squawk Box." 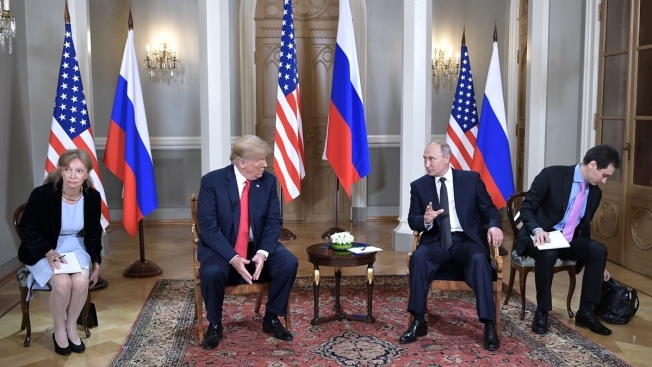 But Trump also said he valued the opportunity to improve the United States' relationship to Russia, even after American intelligence agencies have said that Russia repeatedly tried to interfere in the 2016 U.S. presidential election.